During the past two years alone, several deadly collisions have occurred at the interchange, which sits on Lansing’s west side, near Grand Ledge. An I-96 I-69 accident in 2015 killed a 13-year-old boy and injured several of the boy’s family members, who were thrown from the SUV in which they were riding. A two-vehicle crash at I-96 I-69 in 2016 left one passenger dead, while others suffered various injuries. And so far in 2017, numerous accidents causing injuries have occurred at the interchange. 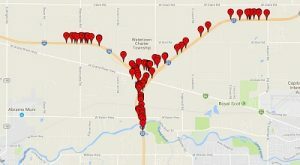 After the deadly collisions in 2015 and 2016, it was hoped the risks associated with this stretch of highway, for both passenger vehicles and semi-trucks, might make people a bit more cautious, prompting them to travel the posted Michigan speed limit and pay closer attention to the roadway — including putting down their cell phones while driving. Unfortunately, that doesn’t appear to be the case, as the number of accidents at the I-96 I-69 interchange continues to hold steady at more than 100 every year. This is one reason why the area has been designated a Michigan dangerous road. The red pins designate the most recent I-96 I-69 accidents in Lansing. Although the number of overall accidents at I-96 I-69 decreased slightly in 2014 and 2015, the number of 2016 accidents was higher than the number for 2012 (100 crashes) and 2013 (106 crashes). 37 involved deer crossing the highway. 19 involved senior drivers (age 60 to 84). 71 involved only one vehicle. October had the highest number of accidents (17). I-96 I-69 Accidents: What Are The Dangers? head west on I-96 into Grand Rapids or Holland. They can then choose to go north on US-131 toward Muskegon, Manistee and Traverse City, or south on US-131 toward Battle Creek and Kalamazoo. travel east toward Flint by taking the I-69 exit. From I-69, motorists can then head north on US-127 toward Mount Pleasant. drive east on I-69 and eventually hit the I-75 exit, taking them into the Detroit suburbs. it is a major thoroughfare. the exit ramps can come upon drivers rather quickly. one exit ramp (onto westbound Saginaw) includes a sharp turn and, if motorists don’t appropriately slow down for the exit, they can find themselves unable to navigate the steepness of the curve. one exit ramp (onto eastbound Saginaw) involves drivers merging into the exit lane, which is shared by those motorists who are also entering and merging onto I-96 I-69. Another dangerous factor is this: there is no guardrail separating the lanes of the highway. It has been asserted that the installation of guardrails may help reduce I-96 I-69 accidents. In fact, it was alleged that the 2015 fatal crash at the interchange may have been prevented if a guardrail had been in place, because the crash involved a vehicle that crossed the median and collided with an oncoming vehicle. While the size and speed of a vehicle can affect guardrail performance, it has been shown that this type of barrier does, indeed, help make roadways safer. Guardrails can also lessen the severity of crashes and, as a result, decrease the severity of a Michigan car accident injury. Guardrails can be beneficial for other reasons, too. They can deflect a vehicle that has veered off the roadway back onto the road. At times, they can also completely stop a vehicle. Because a significant portion of I-96 I-69 accidents involve vehicles striking deer, a guardrail may also deter deer from crossing and entering the highway, thereby reducing the number of crashes and injuries. In the end, the installation of more guardrails on I-96 I-69, and other dangerous roadways in Michigan, would certainly be helpful. In addition, motorists can travel more safely to their destination if they drive the posted 70 mph speed limit, slow down at the exits and avoid distractions while driving. If you’ve been injured in a car accident at the I-96 I-69 interchange, or on any roadway across Michigan, the Sinas Dramis Law Firm can protect your right to no-fault PIP benefits and help you pursue an auto negligence claim against an at-fault driver. Contact our Lansing car accident lawyers or Grand Rapids auto accident attorneys today for a free initial consultation.